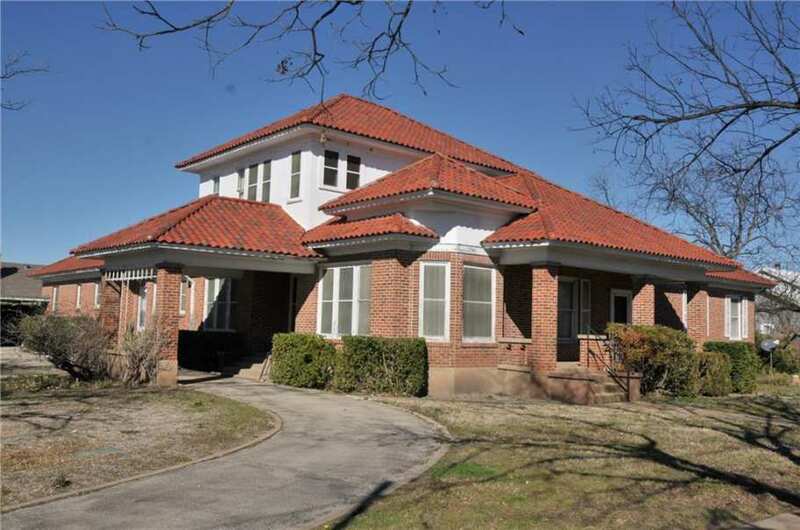 Stately 2 story 1920's home with large covered porch and large circle drive. 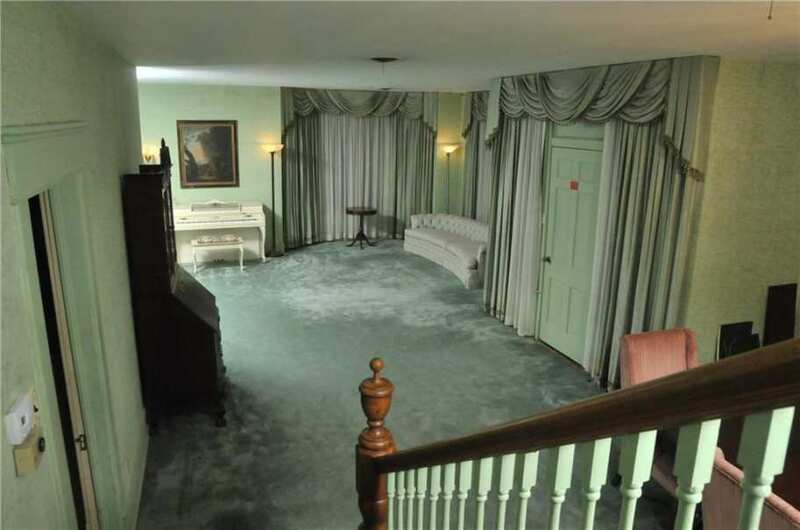 Spacious living room with formal dining room that features original character of its era. 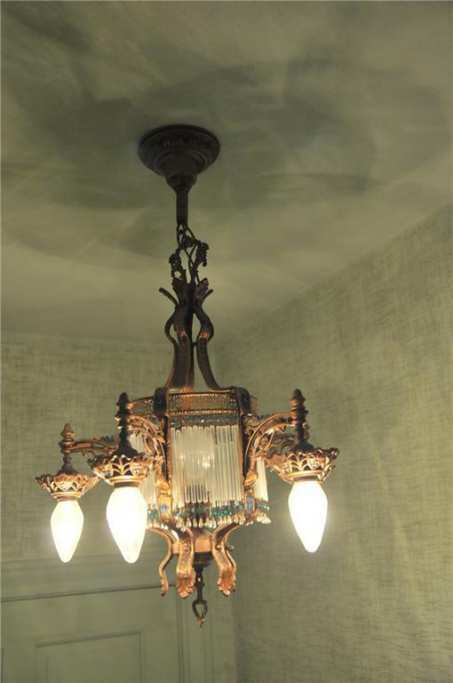 Original chandeliers adorn the tall ceilings. Wood floors of unknown condition under the carpet. 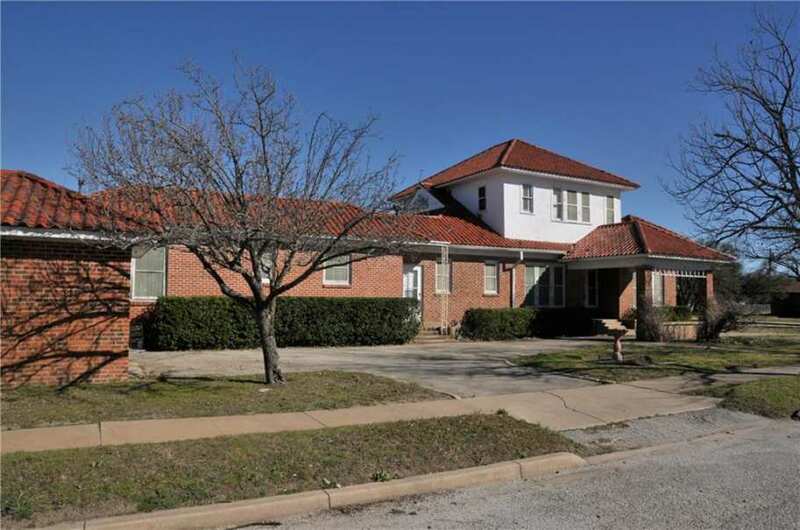 This large home features 4 beds and 4 baths. Large kitchen features vintage 1955 metal cabinets in great condition. Off of the kitchen is a large laundry room, bath and a room used as an office. Retro is in so make the high end wallpaper and drapes handpicked in 1955 by a designer mixed with your personal modern touch to make this the showplace of your dreams. 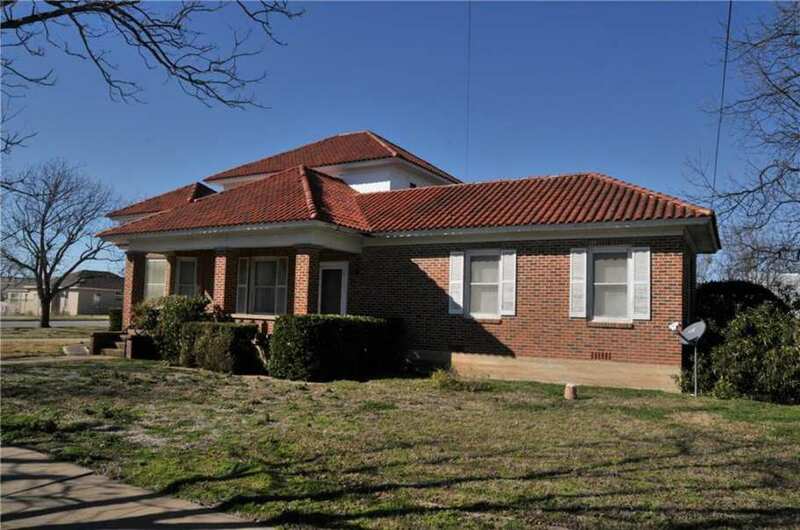 Outside features brick exterior with Spanish tile roof also contains sprinkler system. They said “OH NOT AGAIN ” to me!! Was raised with those things I don’t care for them !! ESpecially in Pepto Bismol pink !! Coming out of that tranquil mint green living room, that kitchen was a total shock! OH. MY. GOD. Total swoonage. 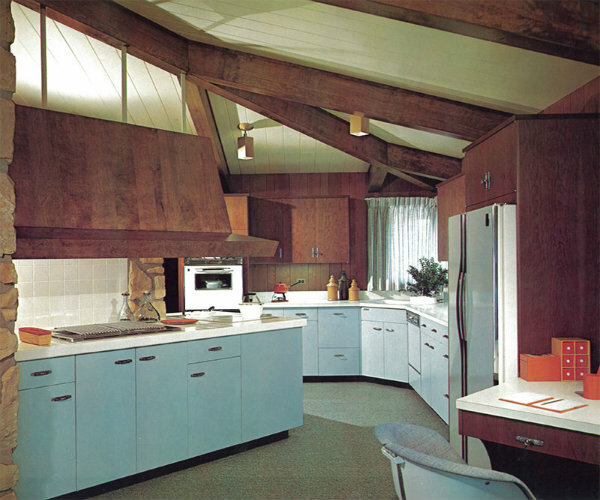 I’m not really even into mid-century that much, but the effect of all those pink cabinets and the darker pink countertop is breathtaking! And those plantation shutters are a nice touch. I like the floor, too. I don’t think the wallpaper goes with the rest, so I’d replace that. And it would be cool to find an oven that complements the cabinets better. I didn’t know it, but this is my dream kitchen! I liked the turquoise bathroom! I love that color and would be very happy with it, though I do have a nagging feeling that the bathroom originally had some cool tile that was vanquished. I’d leave the turquoise paint but I’d probably replace the floor. Those screamed “Liberace” to me! I totally agree! The same thought came to me right away. This look Zsa Zsa’s poodle to me. 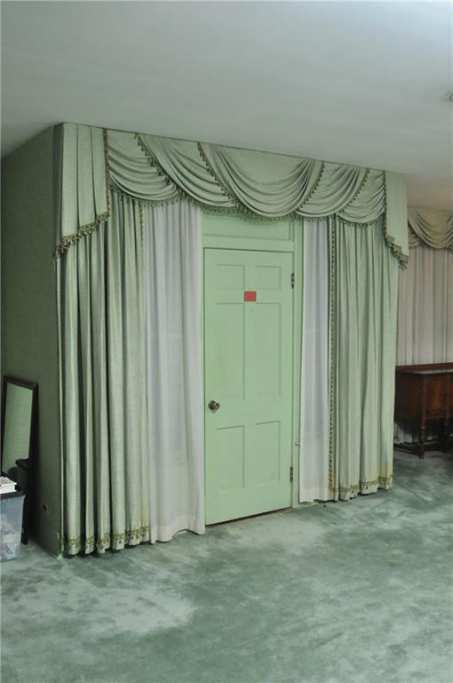 I really liked those drapes ! Being a lover of just about any shade of green, that living room is just gorgeous, as far as I am concerned!! An interesting house in a nearby small Texas town. Not a lot of economic opportunity in Goldthwaite these days with petroleum industry downturn. I feel it’s a bit overpriced for the area, but who knows? Love the kitchen (I’m jealous) , the bathroom and the light fixtures. 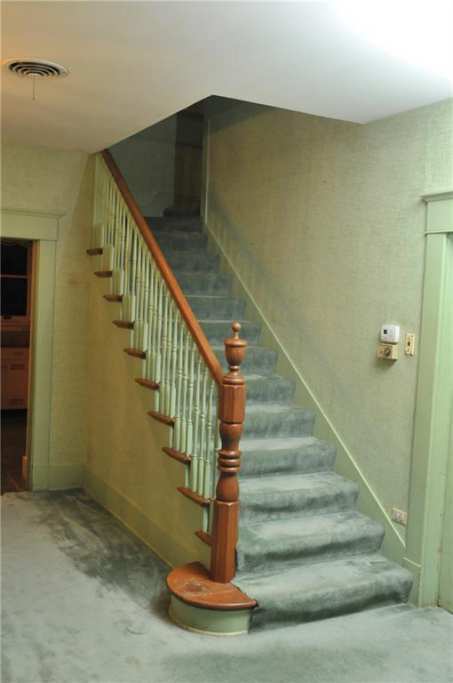 I’m sure it will look much better with that carpet gone. Total time machine! It has a certain swanky appeal. Bouffant hair-do’s, pearls, and legs crossed at the ankles. Cocktails and pinochle after dinner. Period decor only, please. The colors amaze me. Carpet, kitchen, bathroom must stay as is. Always. 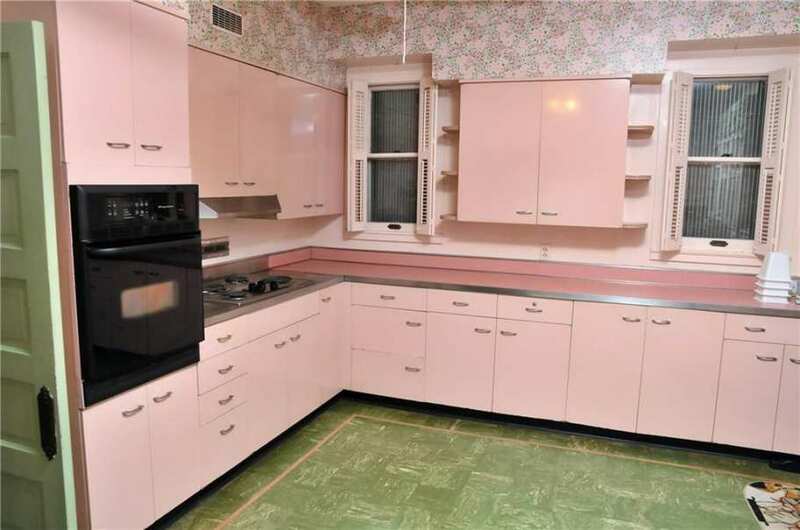 Oh, that pink kitchen! 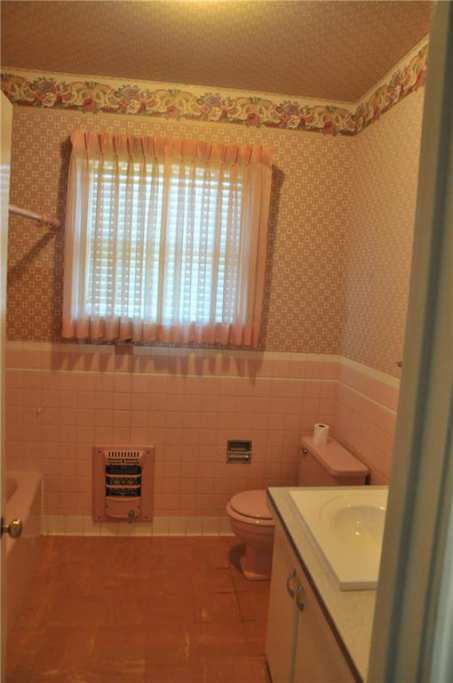 And then the pink bathroom, too! Wonderful! It looks like a set for a movie! Maybe Joan Crawford or Bette Davis! I was half expecting Frank Morgan to step out from behind those curtains. 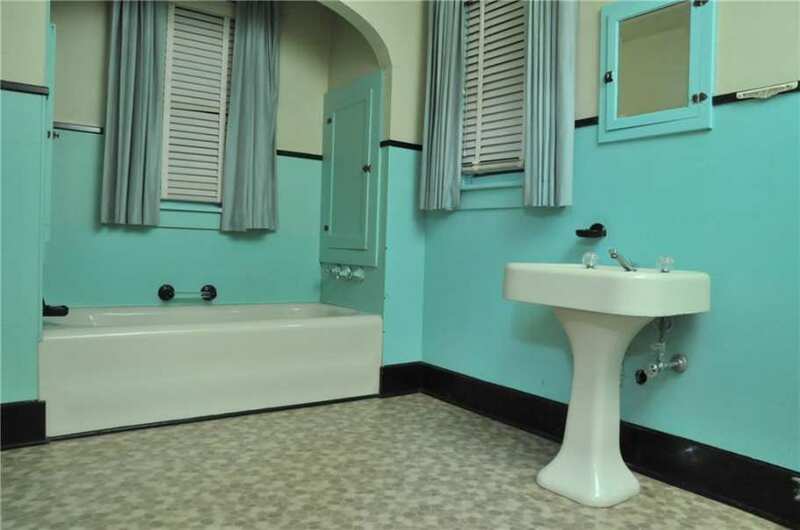 Love the turquoise bathroom and the pink border in the kitchen linoleum. Yes! That border is really nice. I like it more than the greenish main color. Time Warp! 🙂 Beautiful home. My Granny had a friend named Thailia (pronounced they’ll – yuh) whose husband built her a MCM that looked A LOT like this on the inside. She was the most fabulous woman I have ever known. I hope nothing changes inside. It’s a blast from the past! This house is too cool for school. 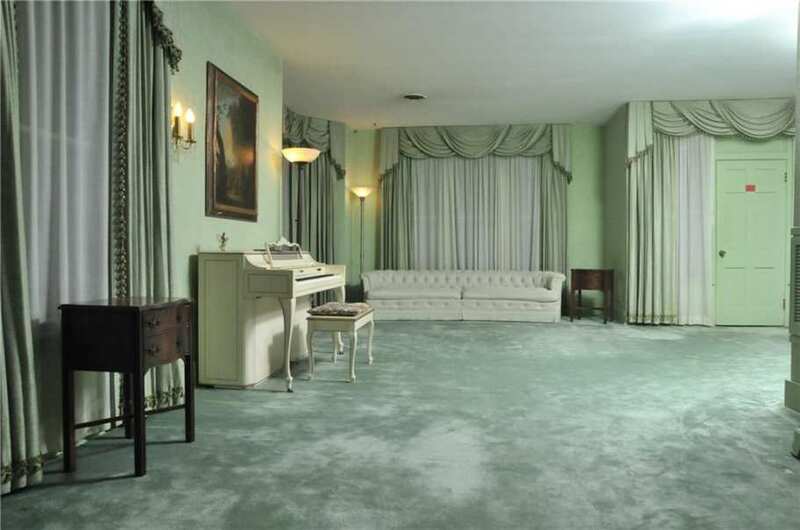 I know it is not up with current decorating trends with the green drama drapes, sea foam green carpet and pink accents but I would feel guilty changing anything. 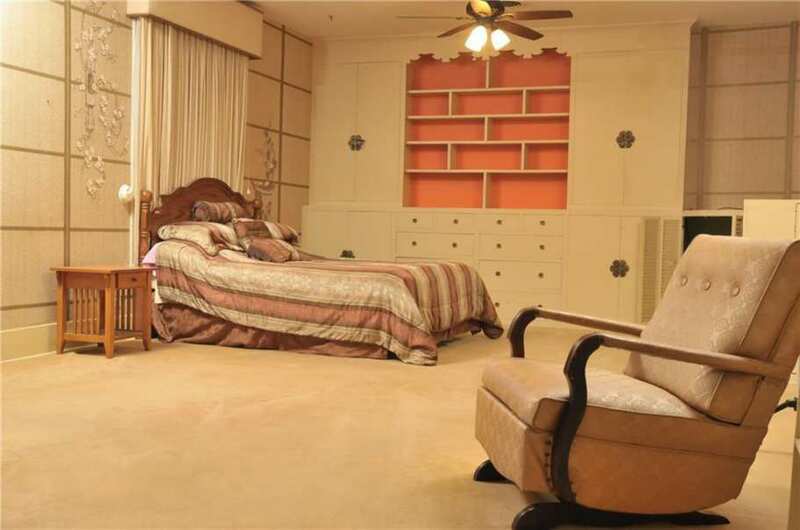 This is a true time capsule that was apparently done for a lady by a professional decorator. Not my taste but I’d live here and love look on the face of guests when they walk in, kodak moments! Ha! “Kodak” is right!—no smartphone selfies allowed! This house looks like ice cream no….sherbert. Yum. Not enough “wow’s” in the world for this one! I was not expecting the swanky vintage interior based on the outside. 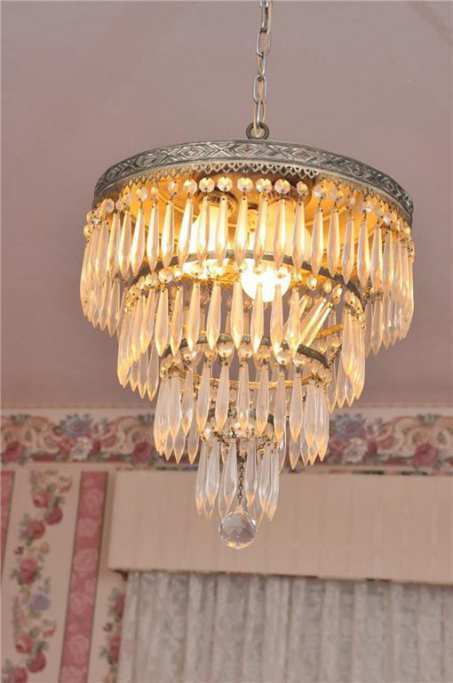 The interior actually reminds me a lot of my grandmother’s house; brings back the memories! Wow……that is A LOT of sea foam green. 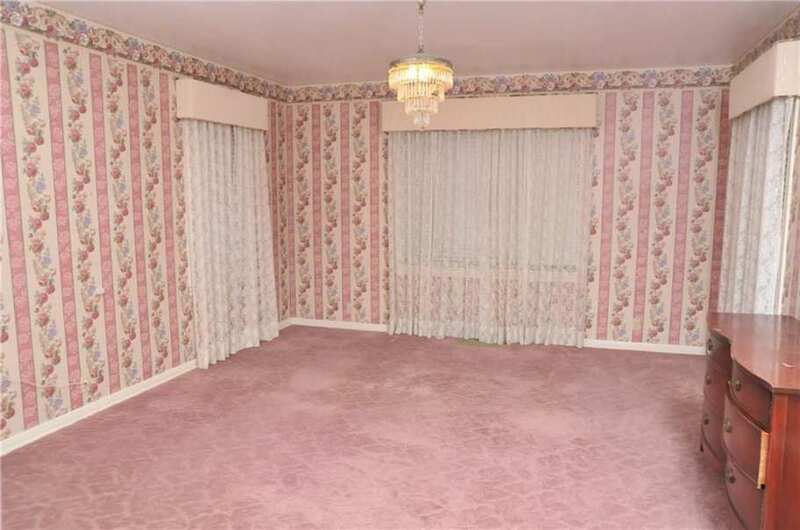 The drapes & carpeting would really have to go & some of that pink would need toning down. 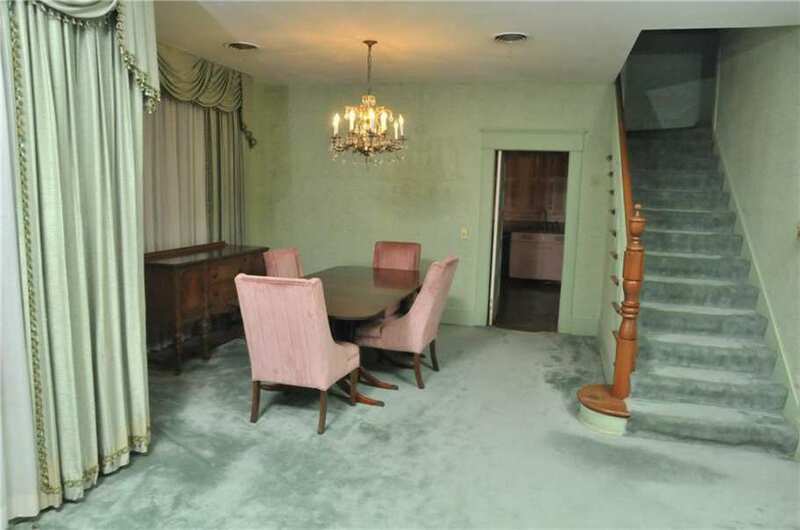 If someone doesn’t like all that pink they’d do better finding another house rather than toning down this one. 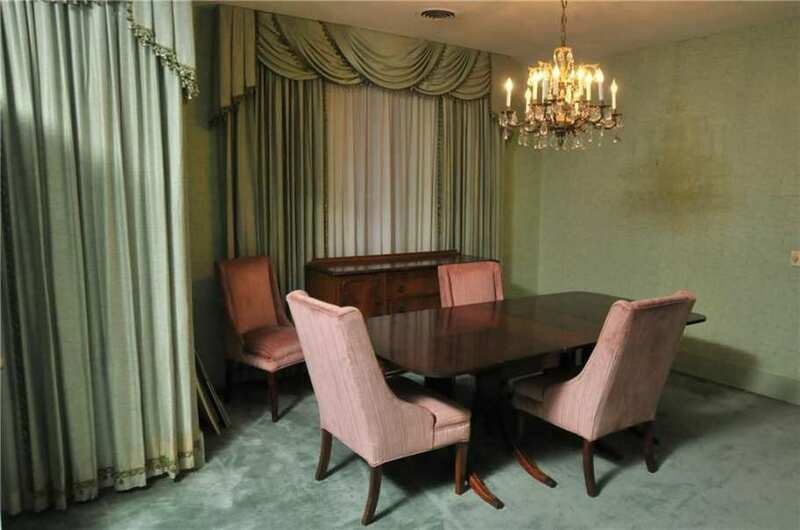 And really, what IS the house without pink and sea foam and drapes and carpeting? I like the way you think. Perfect home for them. It wouldn’t matter how tired and grumpy you were when you came home from work…just a few steps in to that kitchen would cheer anyone up! Time to dust off the kitten heels, Chanel suit, pill box hat and white gloves and move to Texas, ya’ll. Are pink Martinis a ‘thing’??! The pink kitchen cabinets are my favorite thing in the house, but I also like the turquoise bathroom a lot. Another cool feature is that odd built-in storage/shelves unit in the first bedroom. There is so much to unpack here. 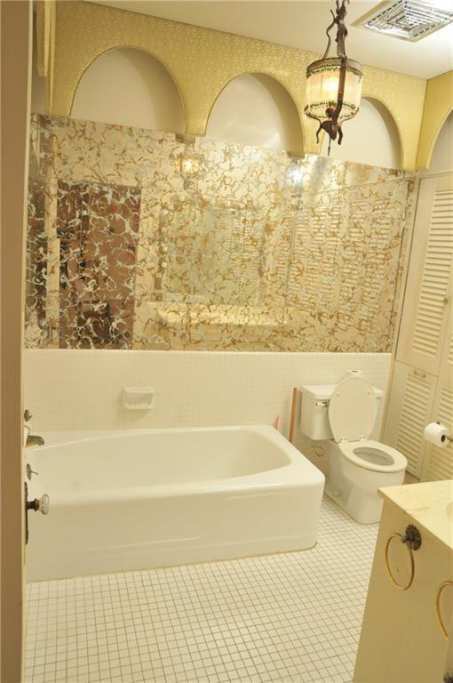 Like…check out that gold arched thing in the gold-and-white bathroom. So awesomely puzzling! Looks pretty neat with the gold-veined mirror though. Adding built-ins to rooms like that must have been a “thing” in this part of Texas in the late 50’s. Our house in Strawn has some just like that. They were added to the sleeping porch when windows were put in it. 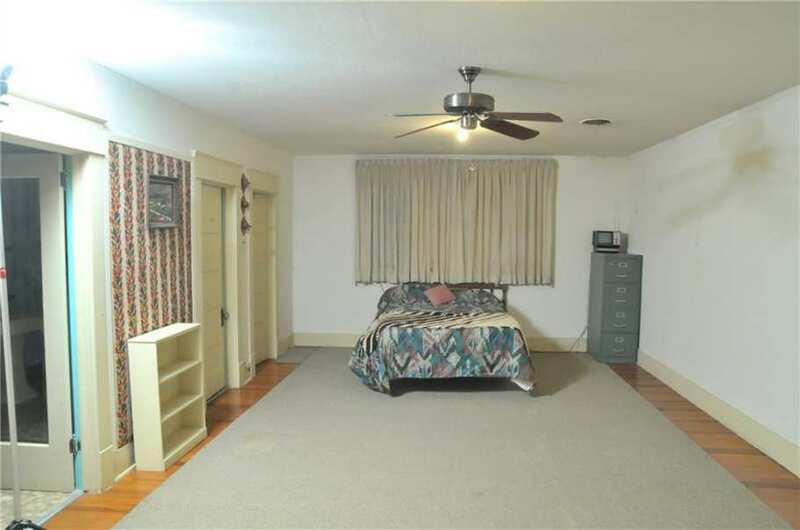 We use it as the master bedroom. I know at least one other 1920’s house here that had them added then as well. I love mine! 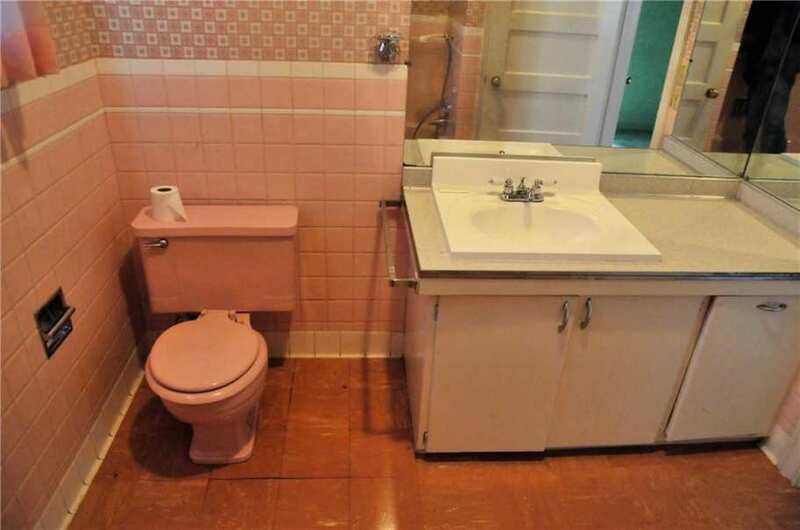 We even have a pink bathroom that looks a lot like this one, although our second bathroom is blue. I wonder what the original front door looked like; it was probably more compatible with its dramatic surroundings than what’s there now. I better get married before I move in there. Fun house for sure. I just adored this. I’d find it hard to return it to the original interior look. 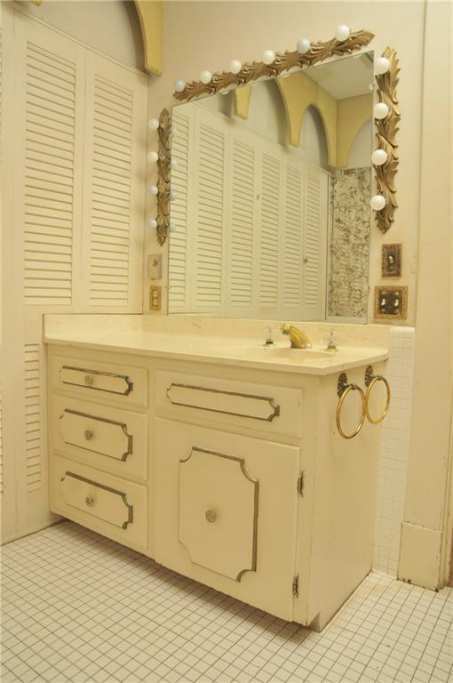 Loved the bathroom! That living room…wow! This place is so cool! The kitchen stays as it lays…please!